Ideal for couples, this hotel offers a good standard of comfortable accommodation, close to the beach, and within easy reach of the resort centre. Previous reviews more or less spot on. Entertainment we didnt stay but as returning watched some very interesting acts as walking slowly past. Line dancing to M Jackson was a new one on me. Infact les played the piano better. Could not comment on the sunbed rush as spent every day on beach but the pool area seemed busy. When we arrived, our first impression of this hotel were that it looked very smart. The porters were on hand to take the guests luggage to their rooms if this was required. The reception staff were very friendly on check in. Our rooms were very spacious. In ours were my wife, myself and our 6 year old daughter. We had a pool and sea view which was absolutely gorgeous. There was a tv in the room which showed english channels aswell as some sky and spanish. Also in the room was a fridge, this operated off the electric so you would need to keep the key card in. My advice is take an old Boots Advantage or some other type of card to leave in all the time. The air conditioning was great although it could get a little noisy so change the setting of the fan to quiet and you will be ok. Rooms cleaned every day, one word of advice if you put up a washing line the maids will take it down, we just took ours down in the mornings. Well, as previous reviews have said it was NOT VERY GOOD. Infact there was no section for children, when we asked the rep why this was his reply was that the spanish say that if the children are hungry then they will eat anything. What a load of rubbish. It was very hard to put a meal together unless you just wanted salad. The desserts were very poor but if you like creme caramel or mousse you will be ok. The great thing is you do not have to get up at the crack of dawn if you want a sunbed. The gates did not open until 9.30am so it was great. The pool area is quite spacious with ample sunbeds. The pool bar was VERY EXPENSIVE. My advice is if you need to ask the Direct Holidays rep Big Al for anything then DON'T, go to reception first they are more helpful. When you go to your welcome meeting he will forget to tell you about the Zoo, the Adventure Golf and the Castle. I think these are must see places. We booked this hotel cause it said 4 star.....well its not..more like a 3 star if your lucky. The reception area is nice and the staff were friendly. The rooms were big enough for a couple but we had a 3rd bed in both rooms. Still ok but a bit tight by the balcony door. Room was not cleaned everyday but the beds were made daily. Now if your going like we did in high season and very hot make sure the air con is working well, cause ours was rubbish. We did ask to move rooms cause it was too hot in the room cause of the air con. The air con did get better (not much) in the middle of the week but by the end of the week it was the same rubbish. So check it before you unpack cause its a nightmare. To be fair the room were very quite cause of the carpets on the floor and we have all had it with the people above moved evrything in the room but none of this here. Breakfast is a joke as its a free for all and once you have waited to get to the dishes you can spend a few mins chasing the greasy egg around the greasy pan. Thats if you can get it on your fun sized plate, not sure if it was a saucer for my tea at first but no its the plate for breakfast. Dinner is in a different area, nicer setting but not alot of choice. Great about 15 mins walk to the harbour with bars, shops and places to eat along the way. Beach is 2 secs away. The resort is very nice with lots to do and a visit to the zoo is a must its worth every penny. Drinks out and about are not over priced little less than back home. Reading the reviews before was a little bit worrying!! After visiting I can honestly say that we have stayed in many 4 star hotels, but this was not one of them. 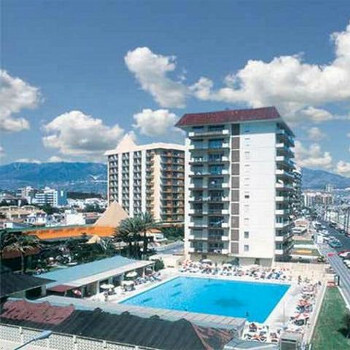 The hotel is clean the rooms are great with nice views of pool / sea and the staff are very helpful. The hotel loses a star on the food front, breakfast is a complete joke! you get a plate the size you would put a cob on to have with soup!!! The most you can place on the plate is 1 toast 1 egg and a few beans, you can have two plates or 2 /3 journeys to the buffet. It's very basis and you just grab a table fetch your own knives / forks etc. the area is very small were the buffet is and you have to be careful not to bump into people. On the plus side, loads of outside tables catch the early sunshine very nice for breakfast. evening meals nice food but very limited with choice, plenty cold meat and salad, plus 3/ 4 hot meals mainly meat in some sort of sauce, chips / soup/ rice. One night my wife was eating the soup and found some wire wool in it!!! Shouted the head waiter over and he just picked it up and smiled? if this had beed a small child it could have choked on the wire. entertainment, very poor same organ and sax every night. The hotel as a good hairdresser from Hull so if any ladies fancy a wash and blow 15 euro's. Hotel drinks and food a bit pricy tendered to go out most nights. Pool opens at 9 - 30 on the dot plenty of lido's. The hot pool is lovely and warm if the weathers bad very relaxing. The hotel was excellant, cleanliness was top class the room was cleaned everyday along with the towels, the food was also top class and the location was right on the beach front. The entertainment was the only downfall of this hotel it was not up to much. Visited this hotel for 1 week on Bed and Breakfast and in general we thought this hotel was well looked after and clean. It has a great location near to the beach and promenade and is about a 10 minute walk into town. There are pleanty of bars and places to eat just on the promenade so we did not feel the need to go Half Board. Staff were ok the normal Spanish not over friendly but helpful netherless.Breakfast was buffet style and adequate. To sum up good value for money and good location. This was our first time at Las Piramides. Our room was cleaned every day and was kept spotless. Location of hotel was great for going to beach only a very short walk. Staff at reception for the two weeks we were there never made us feel welcome! As for head waiter who showed us to table he just signed to us from a distance to come forward. There was a man who played a piano in bar every night which nobody took any notice of it was awful!!!! This hotel is four star but should be three because of staffs manner and food.